Royal Chitwan National Park (currently also called "Royal Chitwan National Park (RCNP)" ), covers an area of 932 km², constituting the first national park of Nepal. Established in 1973, UNESCO recognized the park as a World Heritage Site in 1984. The Royal Chitwan National Park lay in the subtropical inner Terai lowlands of South-Central Nepal in Chitwan district (200 km away from capital Kathmandu). The Royal Chitwan National Park is the best example of a pristine Lowland Teria region in the Indian subcontinent. It provides a refuge for endangered species. Bordered by the Parsa Wildlife Reserve, the Bara Hunting Reserve, Indian Valmiki Tiger Reserve, with Royal Bardia National Park neighboring, the park provides an environment for endangered species to survive and thrive. Foremost among them are the Single-horned Indian Rhinoceros and the Bengal Tiger, which have the largest populations in South East Asia. The Royal Chitwan National Park serves an extremely important purpose by protecting the environment and wild life from encroachment. Throughout India, authorities wage an ongoing struggle to protect the nature and wildlife preserves from hunters poaching and farmers seeking to clear land for fields. That holds true for Chitwan as well. The indigenous people of Tharu populate most the villages and cities in the region. The park officials, and the Indian government, have been attempting to provide farming land, while protecting the preserve. The park boasts abundant an flora and fauna, including one of the last populations of single-horned Indian Rhinoceros (Rhinoceros unicornis) and the Bengal tiger (Panthera tigris tigris). The area formerly had been called the "Four Mile Forest" (चार कोसे झाडी), used as a reserve for big game hunting until 1951. The government offers canoeing, elephant rides, and guided jungle walks to visitors. The Parsa Wildlife Reserve (49.900 ha) sits adjacent to the National Park in the east with the Bara Hunting Reserve (25.900 ha) further east. In the south, the Chitwan sits contiguous with the Indian Valmiki Tiger Reserve. The vegetation consists mainly of moist deciduous forests, with the Sal as dominating tree species. In the Churia Hills, pine trees predominate. On the floodplains of the large Rapti, the Reu and the Narayani rivers large areas covered with Elephant grass alternate with riverine forests mainly composed of Simal, Khair and Sisau trees. UNESCO pointed out the Royal Chitwan National Park as the last pristine preserve in the Nepal Lowland Teria region. 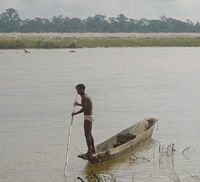 The Terai ("moist land") comprises a belt of marshy grasslands, savannas, and forests at the base of the Himalaya range in India, Nepal, and Bhutan, from the Yamuna River in the west to the Brahmaputra River in the east. Above the Terai belt lies the Bhabhar, a forested belt of rock, gravel, and soil eroded from the Himalayas, where the water table lies from five to 37 meters deep. The Terai zone lays below the Bhabhar, composed of alternate layers of clay and sand with a high water table that creates many springs and wetlands. The monsoon-swollen rivers of the Himalayas inundates the Terai zone yearly. Below the Terai lies the great alluvial plain of the Yamuna, Ganges, Brahmaputra, and their tributaries. The Royal Chitwan National Park lays within that Terai region. The Terai-Duar savanna and grasslands constitutes an eco-region that stretches across the middle of the Terai belt, from Uttarakhand state through southern Nepal to northern West Bengal. The Terai-Duar savanna and wetlands comprise a mosaic of tall grasslands, savannas and evergreen and deciduous forests. The grasslands number among the tallest in the world, nurtured by silt deposited by the yearly monsoon floods. Important grasses include Kans grass (Saccharum spontaneum) and Baruwa grass (Saccharum benghalensis). The eco-region embraces the Royal Chitwan National Park, serving as home to the endangered Indian Rhinoceros (Rhinoceros unicornis), as well as elephants, tigers, bears, leopards and other wild animals. Much of the eco-region has been converted to farmland, although Royal Chitwan National Park and neighboring Royal Bardia National Park preserve significant sections of habitat. They serve as refuge for the greatest concentrations of rhinoceros and tiger remaining in South Asia. In Nepal, the Terai differentiates into an "outer" and an "inner" Terai. "Outer Terai" refers to the alluvial, generally forested and often marshy terrain transitional between the 1,000 meter Siwalak Range—the first and lowest range of Himalayan foothills—and the Gangeatic plain proper. In Nepal, The Terai conventionally includes any extent of Gangeatic Plains proper extending from that transition zone south to the Indian border. "Inner Terai Valleys of Nepal" refers to various elongated valleys lying between the Siwalak Range and the 2-3,000 meter Mahabharat Range further north. In India those valleys have the name "Duns" (e.g. "Dehra Dun"). In some places those two mountain ranges lie next to one another, but in other places valleys approximately five to ten kilometers wide and tens of kilometers long separated them. Chitwan southwest of Kathmandu and the parallel Dang and Deukhuri valleys in western Nepal represent major examples in Nepal. 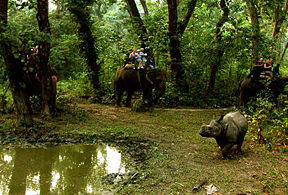 The Royal Chitwan National Park lies within the Terai region southwest of Kathmandu. Inner Terai valleys had been a productive agricultural region, but the infestation of malaria has made the area difficult to farm. The indigenous people of the Tharu had a degree of inherited resistance and populated those areas. After an eradication campaign, people migrated to the Terai from the mountains and from neighboring India. Today more than half the population and by far the most cities can be found there. The Chitwan National Park serves as home to more than 40 species of mammals, 450 species of birds, and 45 species of amphibians and reptiles. Many endangered species dwell in the Royal Chitwan National Park, foremost among them the Bengal Tiger and the Asian One-horned Rhinoceros. Other endangered species include the Gaur, Asiatic wild dog, the Sloth Bear, Gharial, and the Indian Python live within the protection of the national park. Many herbivores live in the park, including elephants, Sambar Deer, Indian Muntjac, Chital, Hog Deer, Mainland Serow, Chousingha and wild boar. Three large predator species (tigers, leopards, Dholes) prey on them and carrion eaters like Striped Hyenas also range the park. Sloth Bears represent one of the main attractions of the Park. Smaller carnivore species include Golden Jackal, Yellow-throated Marten, Ratel, Smooth-coated Otter, small Indian Civet, large Indian Civet, Spotted Linsang, common Palm Civet, Binturong, small Indian Mongoose, Indian Grey Mongoose, Crab-eating Mongose, Leopard Cat, Marbled Cat and Fishing Cat. Other mammal species found in the park include Rhesus Monkeys, Hanuman Langurs, Indian Pangolin, Northern Palm Squirrel, Red Giant Flying Squirrel, Particolored Flying Squirrel, Indian Porcupine, Hispid Hare, Indian Hare and Ganges Doplhin. Among the reptiles Marsh Crocodiles, Gharials and Indian Python measure the largest. All links retrieved July 20, 2015. History of "Royal Chitwan National Park"
This page was last modified on 20 July 2015, at 21:13.